Kalani Hawaii is not your typical hostel, hotel, bed and breakfast or vacation rental. As a fusion of all accommodation styles, we are a unique boutique private lodging offering our guests the finest accommodations on the North Shore of Oahu. Our rooms are rented out individually or joined in privacy for families or groups of travelers. What you will experience at Kalani Hawaii is an escape from the everyday rush, a peek through the palm trees to see how life exists when you're on island time. We offer once in a lifetime memory, beautiful vistas, breathtaking sunsets, and short strolls to famous beaches, snorkeling, world class surfing, and much, much more. For the privacy of our guests we do not take walk-ins and are by reservation only. This being the case, we do try our very best to book last minute accommodations when space is available. If you have any questions please go to our Contact Page, or, if you're ready to book a reservation, please fill out our Reservation Request Form. We also would like to extend alohas to all surfers, organizers, and guests visiting to watch the WSL contests. We are in a very unique location in that we can offer you the best accommodations within steps from all the action. Hope to see you soon! We do apologize as we are unable to accommodate pets. We believe the best way to really get to know us before you visit is through the reviews of guests who have previously (and repeatedly!) stayed with us. 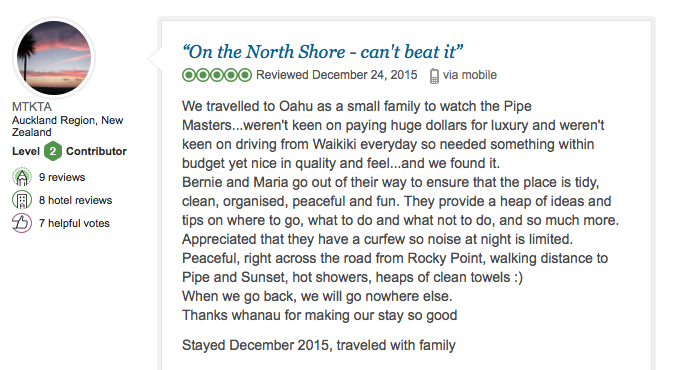 Our guests are the reason we work so hard to be the best place to stay on the North Shore, and thanks to the wonderful things everyone has had to say, we're honored to have achieved the Excellence Award by Trip Advisor - 6 years in a row! See for yourself! 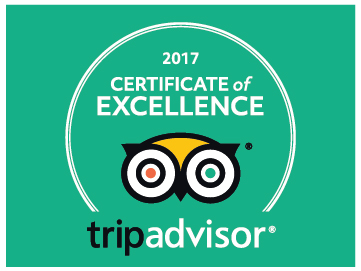 Just click our TripAdvisor badge below and a new window will open to our reviews.